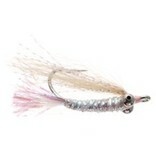 If there is one fly you cannot be without for any bonefish trip it is a gotcha. It is a classic fly that will catch bonefish just about anywhere you can find them and has probably caught more bonefish than any other single fly. Ours are tied with bead chain eyes, a mylar wrapped body and a tan wing. They work extremely well over light sandy bottom.